By the early 60's there was a growing folk movement in Melbourne with such groups as the Victorian Bush Music Club and The Victorian Folklore Society and there was a spattering of coffee shops which featured folk singers, most notably The Little Realta in Melbourne and more importantly to the establishment of Traynor's, The Arab in Lorne. For a number of years, during the summer season, Frank Traynor's Jazz Preachers was the resident band at the Lorne Life Saving Club. During that time Frank met and became friends with singers from The Arab such as Brian Mooney, Martyn Wyndham Read and Glen Tomasetti. Frank had felt for some time that there was a need for a place where jazz musicians could play the music they wanted to play, without the restrictions of "crowd favourites" and dance tunes. In talking to his new "folk" friends, they also expressed a need for a different style venue for their music, one without the noise of chatter and coffee cups. He discovered, to quote him, that "There was a natural affinity between folk and traditional jazz musicians at the time. They had mutual respect for one another, particularly because they were both taking their music from folk roots, they were both a bit underground, they were both totally sincere in what they were trying to do with their music and had a great personal belief in it: there being a message of truth in the music"
Shortly after this time, Glen Tomasetti started the series of Sunday afternoon folk concerts at the Emerald Hill Theatre in South Melbourne and Frank helped out. In late 1963 Frank started the Frank Traynor's Folk & Jazz Club. Commonly referred to as Traynor's, it became a Melbourne icon. Like the Melbourne Jazz Club, which he had established in 1958, it was revolutionary and played a key role in the folk revival in Australia, while at the same time keeping jazz music alive after the boom had collapsed. Because of his busy schedule as a musician, Frank was helped in the running of Traynor's by fellow musician Jim Beal and Don Carless. Don became a legend in his own right and anyone who frequented Traynor's will remember his imposing presence. In 1969, Mary Traynor took over the running of Traynor's until it closed in 1975. 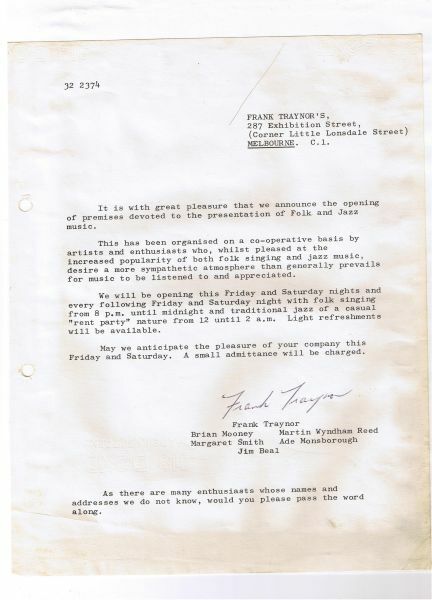 The first singers to perform regularly at Traynor's were Martyn Wyndham-Read, Brian Mooney, Glen Tomasetti, Margret Roadknight, David Lumsden, Garry Kinnane, Margaret Smith, Trevor Lucas, Graham Squance and Kenny White. The combination of jazz and folk music. This created a cross over and blending of folk and jazz for both audiences and performers. Folk singers such as Trevor Lucas, Margret Roadknight, Ken White and Danny Spooner sang with the jazz band and jazz singers such as Judith Durham and Paul Marks sang folk songs. Often folk audiences discovered the appeal of jazz and vice versa. This was in fact the case with Mary Traynor, who came to the venue as a folk enthusiast. A dimly candle-lit coffee lounge with barrels for tables and canvas fold-up stools for seating with almost no choice in beverages and food. There was one spotlight over a small raised platform where folk singers performed sitting on a barrel. The coffee was brewed in a large stock-pot and the only choice was black or white. The only alternative to coffee was Coca Cola and the food choice was between a packet of cheese and biscuits and a pastry. These could only be obtained from a kitchen removed from the performance space during the breaks in the performances. (There was another drink which was provided only to performers. It was a concoction of claret and coke, served in a mug to look like coffee and was aptly named Black Death). The focus was on the music, which was always acoustic and presented in a concert-like atmosphere, with the audience sitting in silence during the performances. Folk music was performed 7 nights a week. On Friday and Saturday, jazz was performed from midnight until the early hours of the morning. Musicians were encouraged to drop in and have a blow or a sing, creating a wonderful opportunity for young inexperienced folk and jazz musicians to play, often with their idols. Traynor's provided a supportive and creative environment with great nurturing of young talent. Singers encouraged the audience to join in the choruses, try out new harmonies and come up on stage to do a song or two with them. Many people who came as listeners became singers, reciters or storytellers, through this sort of interaction. During its 12 years of operation, Traynor's became a home base for folk and jazz musicians, who would drop in even when not performing. They had a room where they and friends could sit around and talk, practice, and exchange songs. There was, at Traynor's, a great interaction between performers and exchange of musical ideas, without any division between contemporary and traditional singers, or performers from other cultures or different art forms. Traynor's encouraged and presented other art forms growing out of folk traditions: flamenco music, exhibitions of paintings, classical music, plays and poetry readings. It also became a reference centre for folk and jazz and a booking centre for folk singers and jazz bands. In addition to establishing Traynor's, Frank did a great deal to promote folk music and help folk musicians. In the early and mid 60s, he staged a number of large scale folk concerts at the Melbourne Town Hall. He toured folk singers throughout Victoria and interstate, often driving them himself. For a number of years 3AW recorded the folk and jazz performance on Saturday night at Traynor's and broadcast it the following day. He helped with advice in setting up the first National Folk Festival (in fact, the constitution was modeled on that of the Jazz Convention). Frank helped performers with everything from musical advice to feeding them and providing floor space for them to doss down for the night. The 'sense' of Traynor's can be summed up by Mary Traynor, who said in an interview: - ".one of the nice things about Traynor's was that it was seen by many as a home away from home, or a touchstone if they were new to Melbourne. Anyone who was a folksinger or was interested in folk music came to Traynor's. There was always a welcoming feeling there, both for performers and audience". Copyright 2015 The Contributing Editors All Rights Reserved, by the Contributing Authors. Cite/attribute Resource. Traynor, M. (2007, February 20). The Beginning of Traynor\'s. Retrieved April 19, 2019, from Traynors Web site: http://www.franktraynors.net.au/the-beginning-of-traynors-1/the-beginning-of-traynors. This work is licensed under a Creative Commons License. Susan Lee- ARcher was often singing Joan Baez and blue grass songs Sat nights at Traynors in 1963-66.She did brilliant guitar equal to Joan Baez and exellent soprano voice.